It’s 1941, and the conquest-hungry Wehrmacht is marching into the vast Soviet Union. One of the largest military campaigns in the history of warfare is about to begin; one that will ultimately lead to millions of deaths and a turning point in the Second World War. Company of Heroes 2, Relic’s latest foray into the world of RTSs, makes no bones about how desperate and costly the conflict on the Eastern Front was for both sides, Axis and Allies alike. Amid the health bars, rapidly spawning digital soldiers and requisition cooldowns, the grim spectre of war atrocities and military pragmatism looms over the Polish, German and Soviet battlefields. 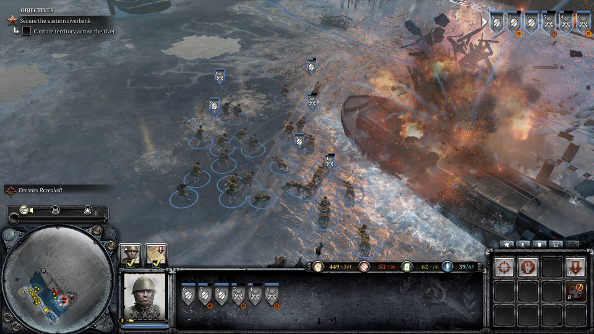 Company of Heroes 2 can be both game-like and surprisingly human, which can cause some dissonance while at the same time elevating it above its contemporaries. Yet it remains very much reliant on the foundations built by the first game, not quite changing enough to make it stand out from its older sibling and its two expansion packs. Completely new experiences are rarely thrown the returning player’s way; but polished, tactical, devastating skirmishes? Well, they are a dime a dozen. 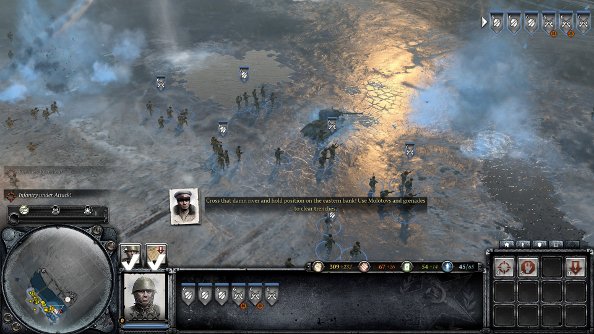 There are fourteen chunky missions in Company of Heroes 2’s campaign mode. They follow Lieutenant Lev Abramovich Isakovich, a Soviet Officer who now resides in a Siberian gulag. They’re presented as flashbacks, as Isakovich and his superior discuss the war and the Lieutenant’s disgust at the atrocities committed by his comrades. The campaign covers a lot of ground: it begins with Operation Barbarossa in 1941 and ends in the conquest of Berlin. It’s also varied, presenting new challenges with every mission. Desperate retreats with soldiers employing scorched earth tactics, base defense scenarios, sniping and infiltration missions, mechanised assaults – there’s certainly no dearth of activities. Each mission has two or three phases, with new objectives being added as old ones are completed. They dramatically change the tone of the mission. The sniping and infiltration scenario, for example, sees a group of Polish partisans sneak around a gloomy, heavily forested map at night, taking out German officers and avoiding enemy patrols. Eventually this leads to an all-out assault on a sizable base, the liberation of a Nazi prison camp and then a desperate, explosive escape to the extraction point, complete with confrontations and exploding vehicles. Noticeably, the campaign missions integrate the resource generation mechanics that the game relies on, by allowing you to capture points organically. You’re not left waiting for fuel and resources to appear before you can build your army. Combine that with varied goals, troop limitations and dramatically different maps and you’re left with a welcome diversity in strategies and objectives. There’s usually something new – a unit, an objective, a commander ability, some crazy weather – just around the corner. And there are a plethora of toys, both mechanical and human, to enjoy. There are countless tanks, artillery, jeeps and soldiers to tinker with, and many of them can be upgraded with new abilities or, in the case of the soldiers, scavenge new weapons left scattered on the battlefield. They leave their mark, too. Artillery bombardments pockmark the ground with craters, creating cover for your infantry. The smoke from explosions blocks a sniper’s field of view. Walls are smashed down by indomitable tanks. Buildings are consumed by raging fires; as engineers wielding flamethrowers attempt to roust hiding foes. But I wonder if the core mechanics haven’t evolved enough from Company of Heroes 1. That won’t be an issue for returning players, but it might disappoint veterans. It remains a slow march forward, capturing resource points, whittling down enemy forces and hiding in cover for extended periods. Some units, such as the sniper, have been altered slightly, but the end result is players doing many of the same things that they did seven years ago. The Soviets provide new units, and there are some tweaks, like like soldiers’ ability to leap over walls, but by and large the changes are less than dramatic in the single-player portion of the game. It is the weather, of all things, where players will see the most significant addition to the formula. 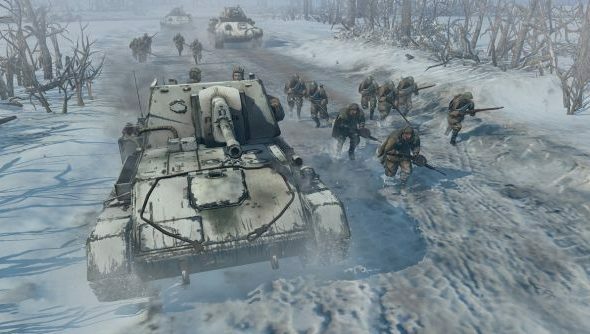 The developers, Relic, have stated that one of the reasons it never made an Eastern Front expansion was due to the limits of the old engine – its inability to recreate the harsh weather conditions that troops suffered during the conflict. Snow is why this sequel exists. It can have quite the impact. Thick drifts hamper troop movement, making traversing anywhere off the beaten track difficult. As soldiers slowly make their way across the white expanse, they leave deep tracks – it’s a good way to divine enemy movements on the winter maps. Using roads is obviously faster, but these more accessible routes are also the perfect spot for an ambush, especially with paths lined with trees or shrubbery. Out of cover, troops might find themselves freezing to death, their body temperature represented by a small, blue meter. When it turns into a tiny skull, they will halt, and eventually collapse, never rising again. Fires, cover, buildings and vehicles negate the hostile weather, so planning one’s route and reacting quickly to the drop in temperature is paramount. Units can walk or drive over frozen rivers, but the ice can also spell their demise. Damage and heavy vehicles can cause the ice to crack, sending soldiers to a watery grave. It’s a tactic exploited by both players and AI forces: river banks are prime ambush spots, especially if they are near a woodland area or surrounded by cover. Weather in Company of Heroes 2 just works: it gives players one more thing to manage during missions, but it never outstays its welcome. Note, too, that there are more missions set during warmer months, so when the obstacle of extreme weather raises its head, it remains novel. I didn’t find the campaign challenging, though. Robust, yes. Story-driven and compelling, yes. But never challenging: either dramatically or mechanically. There is a dissonance between the premise and the mechanics. 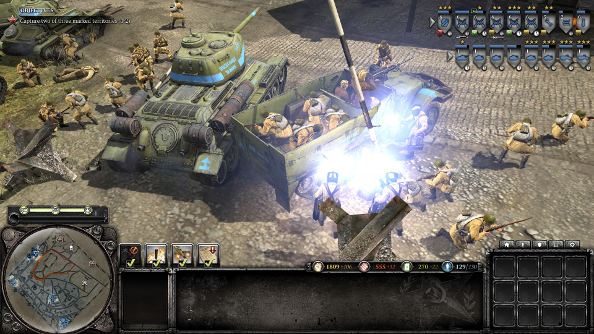 Isakovich laments the brutality and cost of Soviet tactics in the cutscenes between missions, but beyond the videos and a few in-mission scripted moments, there’s little in Company of Heroes 2 that can be described as harrowing. Despite the Lieutenant’s protests to the contrary, troops are expendable and throwaway, and the execution of the deserters mechanic that Relic touted ends up being almost meaningless. For set periods after fresh conscripts are deployed, a commander back at base can shoot routing troops. I only recall one single instance where I actually saw this happen. 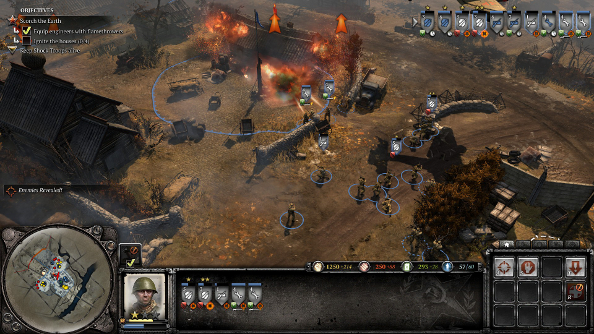 There are some issues with Company of Heroes 2’s campaign AI. Ambushes are rare and seem preordained, enemy troops make poor use of the environment, and despite its unrelenting aggression, it never really poses a significant threat. This isn’t helped by the fact that throughout most of the missions, the only way to lose is by the destruction of one’s base, and one would have to do something terribly wrong for that to even come close to happening. The campaign, then, is polished and rich, albeit lacking challenge. But there’s more. 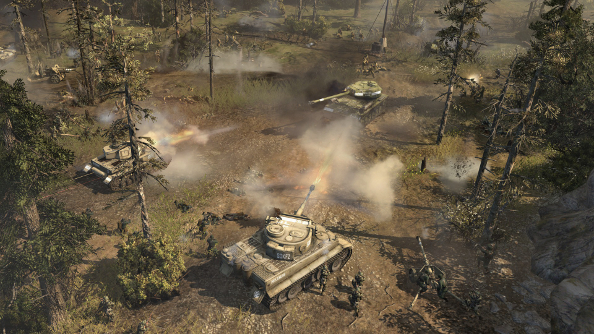 The Theatre of War mode is a series of one-off missions – a kind of strategy bonus pack. Some are single player, some are co-op, some are AI skirmishes. It’s noticeably harder than the campaign: you’ll face intentionally unbalanced scenarios and AI that is substantially more aggressive. There are eighteen challenges in the game right now, with both German and Soviet forces represented, and each faction gets unique scenarios. These encounters run the gamut from simple resource capture skirmishes to stealth missions, and they are far more testing than the battles faced in the campaign. More are to be added as DLC. Then, there’s multiplayer. And it’s good. Thirteen maps are available, with two different modes – Victory Point and Annihilation – for each, and both the amount of starting resources and, in the Victory Point mode, a point limit can be set. While the range of maps is great, the extremely simple modes are somewhat underwhelming. The Victory Point objectives has players racing to capture points, and whomever holds the least key positions slowly loses their points, losing when they reach zero. Annihilation is a basic deathmatch scenario. It hardly oozes imagination. Most noticeable within Company of Heroes versus online modes is the persistent rewards gained through experience: earned both online and offline. If you complete the campaign before venturing online, you’ll have a few unit upgrades and new skins for tanks. Your multiplayer loadout is centred around commanders and intel bulletins. Commanders are offscreen units that can only be called into action after a player has gathered a significant amount of resources, and they can have a devastating effect on a battle. Depending on the three chosen for the loadout, one can gain the ability to call aerial bombardments on an area; spawn new, deadly units; and augment existing units with new abilities, like vehicle crews being able to repair their vehicles instead of depending on engineers. These Commander powers have a meaningful impact on a conflict, and provides even more reasons for players to fight over resources, as they attempt to be the first to acquire these potent abilities. Intel Bulletins are essentially perks, unlocked at certain ranks and after completing particular objectives in both online and offline modes. There are a vast array of them on offer, potentially giving boons to every single unit in the game. One can unlock increased armour for their T-70 light vehicles, faster reloading for their IS-2 heavy tanks or improved accuracy for their basic conscripts, to name but a few. Only three Intel Bulletins may be selected per loadout, so it’simportant to put together several builds. When playing cooperatively, communicating with allies can ensure that you are all using loadouts that compliment each other, filling in the weaknesses that each individual player may have due to their selection. Playing against human players employing different tactics and loadouts means that even playing on the same map on the same mode can present entirely new challenges, and with the deep tactical choice available – made increasingly complex when eight players are in the mix – there’s a lot to love here. Company of Heroes 2 is not quite the reinvention one might have expected after so many years, but by building on the solid foundations of its predecessor, Relic has produced a title that is every bit as compelling as the original, and one of the strongest RTS games I’ve played in a while. New players will find the ease of the campaign an excellent introduction to the franchise, while returning veterans should find plenty to like about the addition of hostile weather and the expanded multiplayer component. There are times when Company of Heroes 2 feels more like a huge expansion than a completely new experience, but damn is it enjoyable.